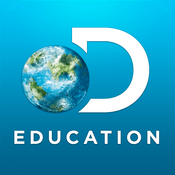 Discovery Education Streaming Plus is filled with rich, engaging digital resources across all K-12 curriculum areas. From core-curriculum subjects to health and guidance, there’s something for every student and every grade level. In the Discovery Education portal you will find full videos, video segments, images, lesson plan ideas, audio files, songs, sound effects, writing prompts, content collections, and much more. On Campus (on CCSD Windows computers): Teachers and students will be logged in automatically. Off Campus (and other devices): Log in using your student or staff Office 365 username and password. Use the link above to open Discovery Education. Enter a topic in the search box at the top of the page. If necessary, use the grade level buttons and other filters to narrow results. Click on any of the search results to play or save it. Most of the results will be videos are divided into segments, so you can show only the parts of the video that apply to your lesson. After opening the page for a video segment, you will see a link to the full video if you need it. Teachers can use the Quicklist and My Content features to collect videos and segments for later use. Click on the Download link on the video’s play/preview page. To comply with licensing restrictions, teachers should not store downloaded videos for long periods of time or share them on other platforms. After clicking on the link above to sign in, return to this page and use the following links to learn more. Getting Started with Discovery Education Streaming is a short video providing an overview of the resources available to you. We recommend you start here to learn more about Streaming. Educator Essentials offers curated content essential to launching your Discovery Education journey, including step-by-step guides, a self-paced learning module, and more. Spotlight on Strategies are creative, research-based instructional strategies that incorporate digital media in meaningful, effective, and practical ways.